We are writing as an update to our Public Appearance at the December 12 Board meeting. You may recall that at that meeting, we expressed serious concerns about how the District analyzes and shares student data. For many years, it has seemed to us that the District reports data more with an eye towards making itself look good than to genuinely meeting children’s educational needs. As social scientists with more than two decades of involvement with the Madison schools, we have long been frustrated by those priorities. Our frustration was stirred up again last week when we read the newly released MMSD 2017 Mid- Year Review, so much so that we felt called upon to examine a specific section of the report more closely. What follows is expressly not a critique of the MMSD elementary school in question, its staff, or its students. What follows is solely a critique of what goes on in the Doyle Building. 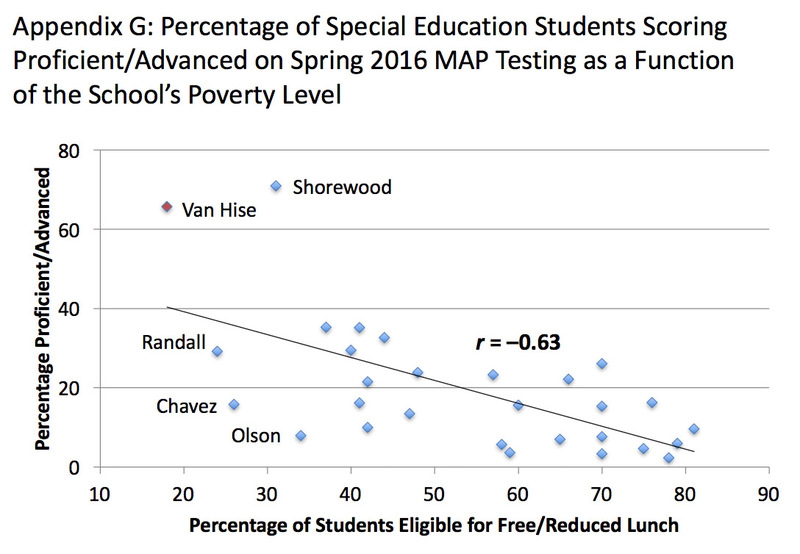 In last year’s Annual Report, Principal Peg Keeler and Instructional Resource Teacher Sharel Nelson revealed Van Hise Elementary School’s “special sauce,” which helped students achieve extraordinary growth in the Measures of Academic Progress (MAP) assessments. 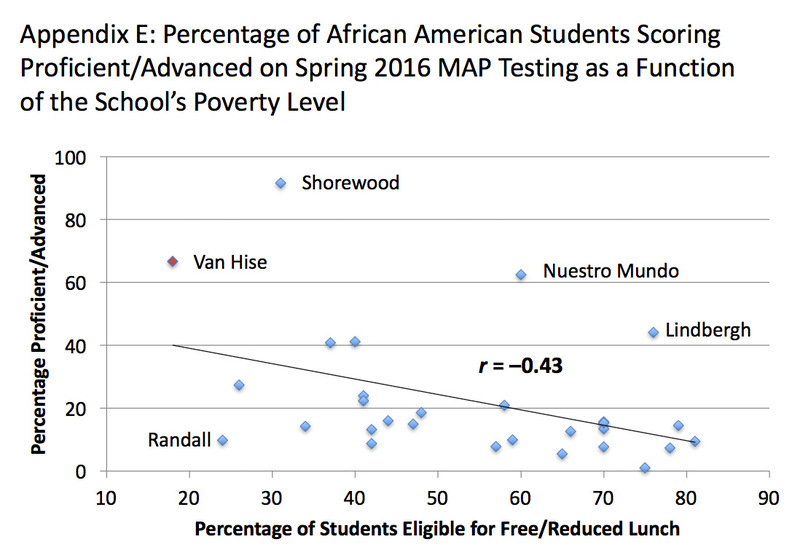 We reported that seventy percent of the school’s African American third through fifth grade students were proficient or advanced and half of third through fifth grade students receiving Special Education services were proficient. We recently caught up with Principal Keeler and Ms. Nelson to get an update on their students’ progress. Nelson discussed the sense of community among Van Hise students and how the Van Hise equity vision encompasses families as partners. “We have a comprehensive family engagement plan. We are working together with our families – all on the same page. The students feel really supported. We’re communicating more efficiently and heading toward the same goals,” Nelson said. We got curious about the numbers included in this update — in part because they are some of the few numbers to be found in the 2017 Mid-Year Review — and decided to take a closer look. All additional numbers used in the analysis that follows were taken from the MMSD website. As you know, Van Hise is a K-through-5th grade elementary school on Madison’s near west side. In 2015-16, it enrolled 395 students, 5% (20) of whom were African American and 9% (36) of whom received special education services. 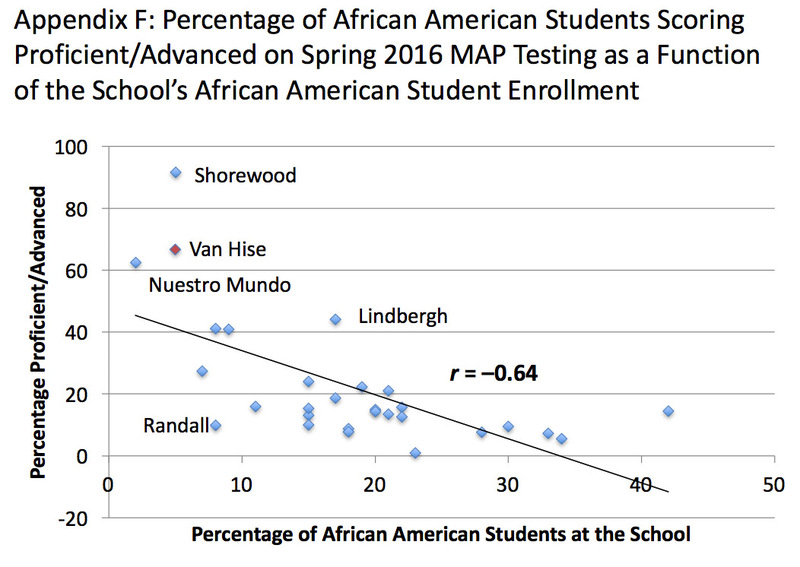 (Note: These percentages are some of the lowest in the District.) For purposes of explication, let’s say half of each of those groups were in grades K-2 and half were in grades 3-5. That makes 10 African American and 18 special education students in grades three-through-five. 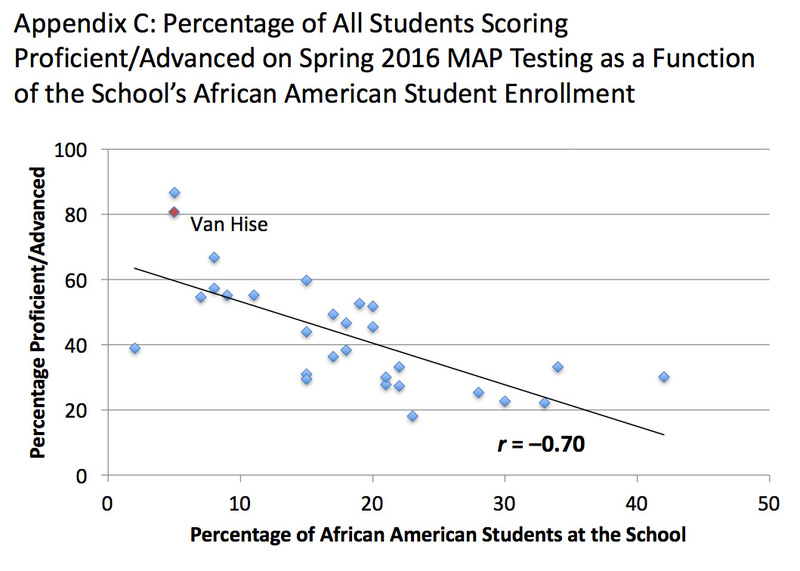 The Mid-Year Review states that in 2015-16, an extraordinary 70% of Van Hise’s African American third-through-fifth grade students were proficient or advanced (in something — why not say what?). But 70% of 10 students is only 7 students. That’s not very many. 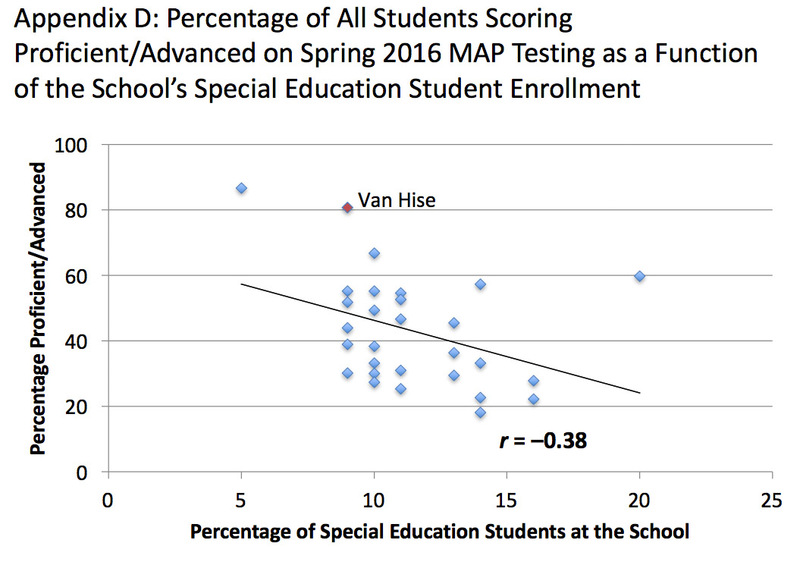 The Mid-Year Review also states that in 2015-16, an equally extraordinary 50% of Van Hise’s third- through-fifth grade special education students scored proficient (in something). But again, 50% of 18 students is only 9 students. 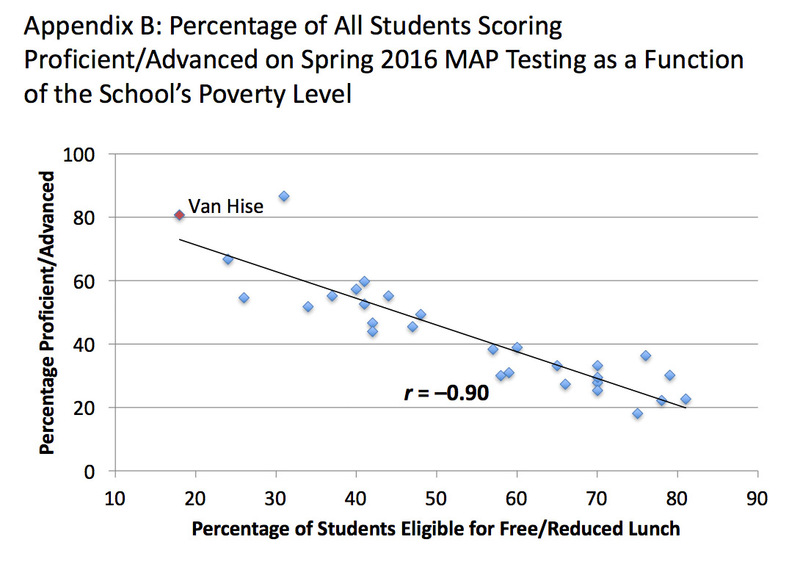 To complete the demographic picture, it is important to note that Van Hise is the MMSD elementary school with the lowest rate of poverty; in 2015-16, only 18% of its students were eligible for Free/Reduced Lunch. (Note: The Districtwide average is 50%). 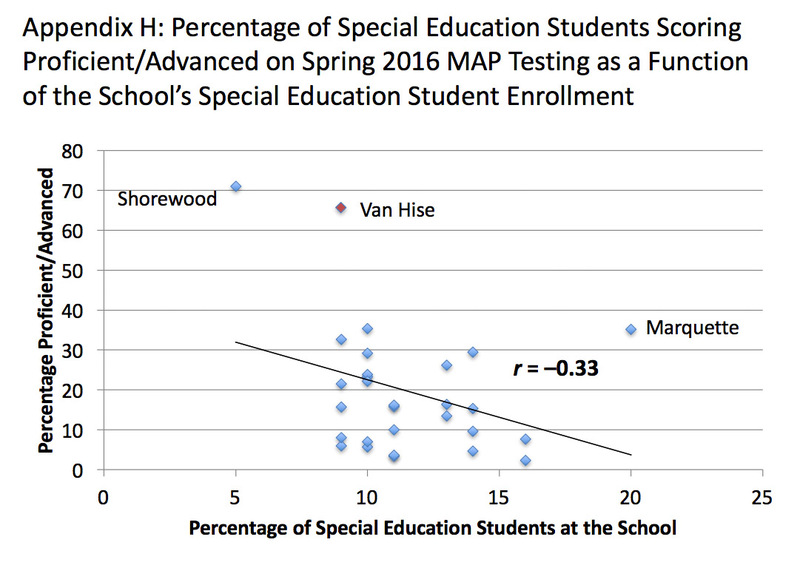 The additional information also makes the Van Hise “special sauce” – whatever it is they are doing in the school to achieve their “extraordinary” results with African American and special education students – far less relevant for the District’s other elementary schools, schools with significantly higher percentages of African American, low income, and special education students. In terms of its demographic profile, Van Hise is arguably the most privileged elementary school in Madison. Perhaps, then, its “special sauce” is nothing more than the time-worn recipe of racial, socioeconomic, and other forms of political advantage. But be that as it may, it is not our main point. Our main objective here has been to provide a clear- cut example of how the MMSD cherry picks its examples and “manages” its data presentation for public relations purposes. We believe the overarching drive to make the District look good in its glossy reports is a misguided use of District resources and stands as an ongoing obstacle to genuine academic progress for our most disadvantaged and vulnerable students. Please feel free to contact us with any questions you may have about this analysis. As School Board members, you cannot work effectively on behalf of our community’s children unless you understand the District’s data. We are happy to help you achieve that understanding. Appendices B through H utilize Spring 2016 MAP data for MMSD third-through-fifth grade students only. 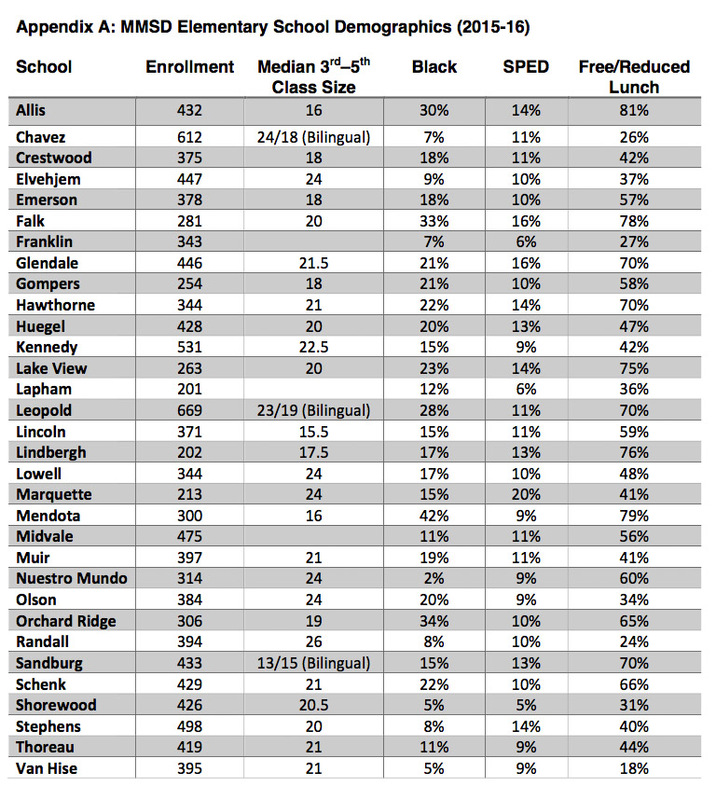 The scores for each school are simple averages of the percentages of students scoring proficient or advanced in reading or math across those three grades. We freely acknowledge that these calculations lack some precision; however, given the data we have access to, they are the best we could do. The Madison School District’s 2016 “Mid Year Review“. Madison expanded its least diverse schools, including Van Hise, via a recent tax increase referendum. 2005 (!) When all third graders read at grade level or beyond by the end of the year, the achievement gap will be closed…and not before.